How do you find LPG gas in Europe? What should you use to refill your Motorhome gas tanks? Can you exchange UK gas bottles in France? We answer all these questions and more below!! 1- Bring Enough Gas with you! So which did we buy? We had just realised we'd just messed up. Pretty badly. It took about 20 seconds for the light bulb to go off, but go off it did. With two UK 6kg Calor gas bottles. You can't exchange UK gas bottles in France. You can't refill UK gas bottles in France. If you buy a French gas bottle, they don't fit the fittings of our UK system! So we're there, suddenly feeling short on gas. (I'm mature- that sentence didn't make me giggle out loud at all. Honest.) Somewhere in between moving house, moving onto the boat, me leaving work and having a million little jobs to do, we'd forgotten our plan to buy and install a refillable gas system, which allows you to refill the bottle via a pump at a petrol station- just like you refill your car. Which is great, and useful…. but we hadn't done it. So the big question is- How do you get gas in Europe?? 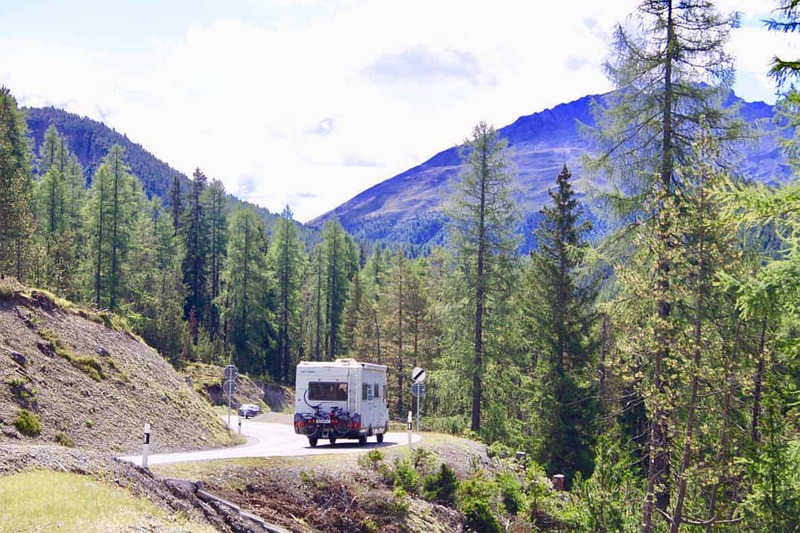 First, I'll give you a quick rundown on the options available to UK motorhomes, campervans and caravans if you want to bring your vehicle to Europe. – Option 1 is straightforward if you're going on a week or even two-week holiday- bring enough gas! We toured Italy, Switzerland and France last summer for just over two weeks and we didn't need to change gas bottles once. I think if we had then we wouldn't have been so forgetful this time! Of course, we didn't use our heating at all during the summer, so that definitely helped. If we're exploring during winter, we find one 6kg bottle lasts us 4/5 days with the heating on, hot water & cooking. – Option 2 is to install a refillable gas bottle system. From the research we've done, this seems to be the best option for us. Throughout Europe, most countries have easy to use gas refill stations in their petrol stations- especially on motorways. You just pull in, get the hose with the nozzle on and refill your tanks. Apparently, they come with an 80% shut-off safety feature, but be careful- we've heard several reports that it can break & the bottles can be overfilled. There seems to be two companies to choose from- Gaslow and Gasit. We'd only heard of Gaslow before, but found Gasit as we were searching for solutions to our ‘How to get gas in Europe' debacle. We'll do some further research & let you know which we choose when we return to the UK. We did try to get a Gaslow system in France. They do sell them, but you need a French address and they need to order them in. We didn't find anywhere that had a system in stock. I think this is true for most places in the UK too, so don't be expecting to drive in and drive away on the same day. – Option 3 is to install a fitted LPG tank. We thought hard about this option, but for us it mad more sense to get bottles as we plan to visit some of the countries where finding refillable gas is apparently very difficult- like Morocco. In these places, we can take one of our refillable gas bottles out, strap it somewhere safe and connect an exchangeable bottle instead that we buy as needed. But if you're not planning on doing something crazy, or if you think your gas will last, then a tank might be a good option for you. I believe Gaslow do the fitted tanks but I'm sure there will be other companies too. – Option 4 is to use exchangeable gas bottles in each country you visit. This really worried us as we had been told that you had to have an address in each country in order to get a bottle. And there's the issue with the connectors and the whole system not fitting each other from country to country. It can also get pretty expensive as you buy a gas bottle (and pay the deposit) and obviously can't often return it to get your deposit back! It's probably worth visiting a larger chain, such as Carrefour or Intermarche supermarkets in France to get your bottle- although we've heard these places are a lot stricter on paperwork than others. – Option 5 – don't use any gas. Stay on campsites and use electricity. – Option 6- go home sulking or don't go at all! So, those are your options. Let's ignore 5 & 6 and say there are 4 (that I know of- please let me know if there are any more!) The question is which one did we choose? Some people cook every night over a campfire- I am in awe of them!! Our first port of call was Leroy Merlin- a massive hardware store in France. We felt convinced that this mecca of all things would have gas fittings- and they did. Row upon row upon row of them. It became clear very quickly that we were woefully out of our depth and had no idea what we needed. Our Calor gas bottles are propane, which is perfect for us as it allows the gas to be used even in low temperatures. Butane struggles if you put it below 10 degreesC – so not ideal in the UK. But here there were fittings for Butane, Propane, LPG…. it was completely overwhelming. At this point I need to give a shout out to Mr and Mrs Adventure, who I emailed asking for help! They have just travelled Europe in their van (and are about to do so again very soon) so I figured they'd have some answers. They were great and very helpful- reassuring me that you could get gas bottles from most countries without much issue. Leroy Merlin doesn't sell gas. The local petrol station (with the gas rack outside) was open… but automated payments only. Did I mention it was Easter Monday and therefore a national holiday?? There was no one on duty to sell gas. Some supermarkets were open, some were closed. We managed to find one that shut at 12.30… naturally, we pulled into the car park at 12.28. Still, the staff were incredibly friendly and came out to see if we could figure something out. NOTE- no local station or supermarket sells refillable gas bottles such as Gaslow. They have to be specially ordered & fitted. Le Cube- very neat 6kg bottle, coming in either Butane or Propane. Fit easily. 13kg massive bottle coming in either Butane or Propane which we were convinced wouldn't fit. Little Dumpy bottles (I'm fairly certain they have another, better, name but we don't know it!) These have a wide base which we think would be too wide for our gas locker. So, out of all these options, which gas bottle did we buy? None of them. “Why??! !” I hear you asking, or indeed screaming at the screen. Why wouldn't you buy gas when the shops were all shutting and it's 5 degrees at night and you need heating!?! By this point, everything is closed (Easter Monday remember). We decide that the best option is to visit a caravan/ motorhome shop. After all, many French motorhomers will visit Germany- especially when we're only 15 miles from the border. Surely they would know what we needed & have the correct parts. Of course, the shop didn't open until the next morning, so we found a shop (type in motorhome dealer or motorhome shop into google and you should find something near you) and then we used park4night to find an overnight stop nearby. We ended up at a cute little campsite in some woods next to an abandoned potassium mine. The mine looked really eerie, so we decided to get the drone out and see what we could see! The next morning we met a lovely couple, Ruth & Frank, who are exploring in their converted van (which has room for TWO yoga mats. I'm not jealous at all!) After a lovely time chatting with them and enjoying the heat from their woodburning stove, we set off for the motorhome shop. The guy looked at us like we're a little crazy, shrugs his shoulders in the way the French do so well and pulled a Le Cube out of the crate instead. Feeling much happier, we pulled our empty 6kg bottle out and replaced it with Le Cube. It fit- easily. ‘Vous voulez essayer le gros(se)?' The Frenchman enquired politely. Do we want to try the bigger bottle? Oh, go on then. Also, when we attached the french tail (the hose which goes from the bottle onto the van system), it went straight onto the UK regulator valve without a murmur. No hisses, no leaks, no forcing…. dead easy. We paid 45€ for the gas bottle. We did have to write down our name and address but he didn't seem to care if we had a French address or not and we never mentioned we had a house in France- so he must have assumed we didn't. So all in all, it was a bit anticlimatic…. but we were very relieved to get gas! It is NOT as scary as Google and motorhome forums will lead you to believe. You can buy a gas bottle in France without a French address. If you get stuck, use a local campsite address. The french tails fit fine onto the UK regulators. You can buy french tails from hardware shops (like Leroy Merlin) and gas bottles from most petrol stations. Or visit a camping/ motorhome shop. You may be able to get a 13kg bottle into your van gas locker. If you can, do- it gives you a bit more freedom! If you plan to install a refillable system- do it BEFORE you leave. Caravan/ motorhome shops are all over the place and we've never met an unfriendly one yet. Even if you don't speak the language, they will know what you mean and help you out as much as they can. Just practice your panicked face in the mirror first. So now we have gas! 24 hours of slightly overwhelming terror, followed by the realisation that we needn't have worried! Still, silly us for getting ourselves into the situation in the first place. Make me feel better- what's the biggest silly mistake you've made in your van? Just to let you know we’refollowing WB and her adventure. As the guy dressed in a German helmet used to say i the Rowan and Martin Laugh In show (who would remember that for goodness sake!) it’s all “veeeeery interesting”. The goal of each player is to conquer the seller and also the gambler is capable of this by having the larger, undusted hand.